Fresh, wild salmon is my chateaubriand or prime rib or whatever meat lovers think of as the pinnacle of protein. I’ve read a lot about salmon fishing and the sustainability standards that protect future populations of wild salmon, and I’ll include a list of a few of those books below. What I’ve learned is that one of the best things consumers can do is to support fisheries that operate sustainably. I get excited for the start of wild salmon season and to see the first-of-the-season salmon at our fish counters in May. This year, I was contacted by the Copper River/Prince William Sound Marketing Association and asked to help spread the word about fresh, wild, Copper River Salmon and where it’s available. I was happy to do so, and I was thrilled to receive some Copper River King salmon. On Facebook, there’s an app for locating and tagging locations of Copper River Salmon at both stores and restaurants. And, there are links to recipes and information about the current fishing season. Some info about King salmon: the season is a little shorter than that of Sockeye since it ends in June rather than August, and Kings are higher in omega-3 fatty acids than any other type of salmon. That gives the fish a buttery richness and great flavor. I prefer to cook it just enough to leave the very middle a good, dark, reddish pink, and a great way to do that is by slow roasting. In the June issue of Bon Appetit, there was a dish that matched just how I wanted to cook this King salmon. Some big pieces of salmon were roasted at a low temperature in olive oil with herbs and cherry tomatoes. Since the fish cooks slowly this way, you can easily check it from time to time to see how it’s progressing. The salmon was served with a yogurt sauce with herbs and lemon zest. In the magazine, there was a couscous dish with tomatoes to go with the salmon, but I changed it a little. 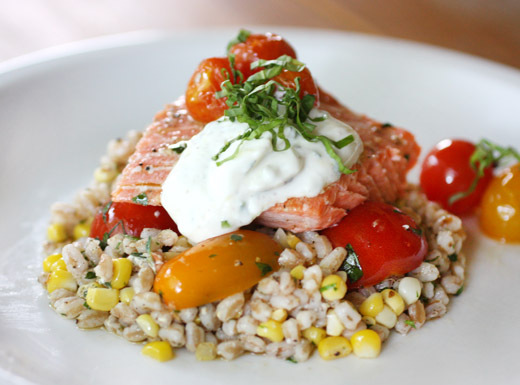 I used farro instead and added some fresh, local corn along with cherry tomatoes and herbs. I used two big pieces of King salmon, and they were set in a roasting dish on a layer of herbs including basil, thyme, oregano, and chives. There was olive oil beneath the herbs, and more was drizzled over the salmon. The salmon was seasoned, and cherry tomatoes were added to the pan before it went into 325 degree F oven. Depending on the thickness of the fish and the desired doneness, it could take from 20 to 35 minutes to roast. Meanwhile, I simmered farro in water and sauteed kernals cut from a few ears of corn in melted butter. More cherry tomatoes were halved and tossed with chopped parsley, olive oil, za’atar, and salt. The farro was drained and then topped with the marinated tomatoes and sauteed corn, more olive oil was added, and the mix was tossed to combine. 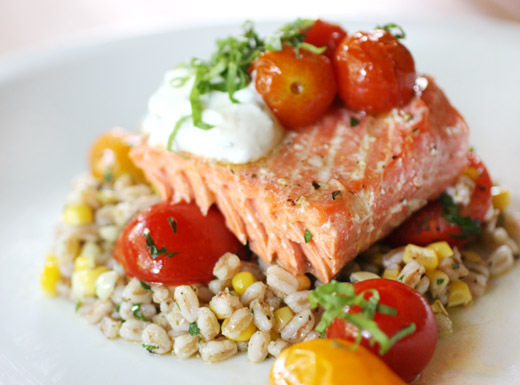 I cut servings of the roasted salmon and served them on mounds of farro topped with yogurt herb sauce. I hope that top photo shows the texture of the salmon well enough. I’ve already called it buttery, and that’s the best word for it. With tomatoes and fresh corn, this meal says summer. I don’t have a good photo of how the leftovers were used, but I can highly recommend making panini with flaked pieces of roasted salmon, some arugula leaves, and lemon-caper-mayonnaise. 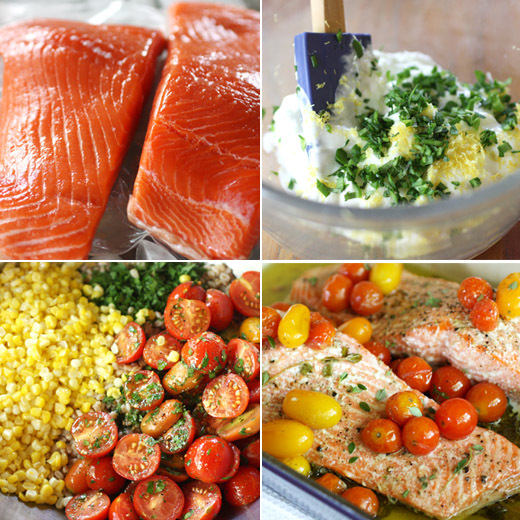 Enjoy the wild salmon season while it’s here, and check back for more salmon dishes coming soon. Recipes from Alice Medrich are always precise and work like a charm, and now she's given us some really easy ones too. 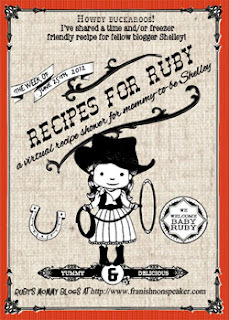 Her latest book is Sinfully Easy Delicious Desserts , and I received a review copy. 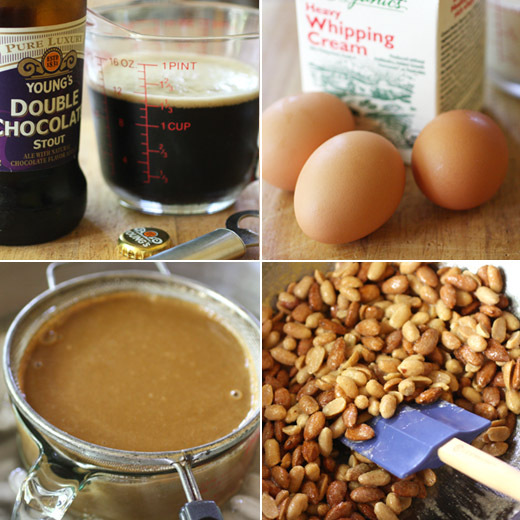 It's a guide to building great desserts from a well-stocked pantry. 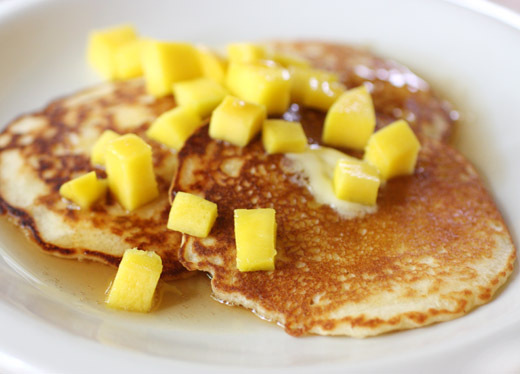 There are recipes for baked desserts, custards, and sauces, but there are also numerous tips for combining different kinds of fruit or store-bought ingredients like ice cream with other components or sauces. And, most recipes come with suggested variations. This book teaches you to be a dessert-MacGyver. The list of "Things to do with vanilla ice cream" alone could fill all of your dessert menus for the rest of the summer. 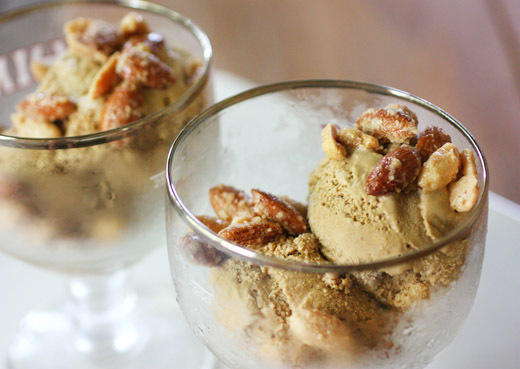 Some of those suggestions include: serving ice cream on cinnamon toast with chocolate or caramel sauce, and Medrich provides three different chocolate sauce recipes and four caramel sauces from which to choose; drizzling the ice cream with extra virgin olive oil, sprinkling with flaky sea salt, and adding dessert croutons; and topping ice cream with Bourbon-Brown Sugar Pecans and peach slices. In the Starting with Fruit chapter, there's a Saucy Cranberry Maple Pudding Cake that I can't wait to try this fall, a Blueberry Cornmeal Cobbler that I'll try very soon, and a list of various fruit sauces both chunky and smooth to add to other desserts. The ideas continue with cakes, cookies, and other sweet bites, and they're all completely simple to do. 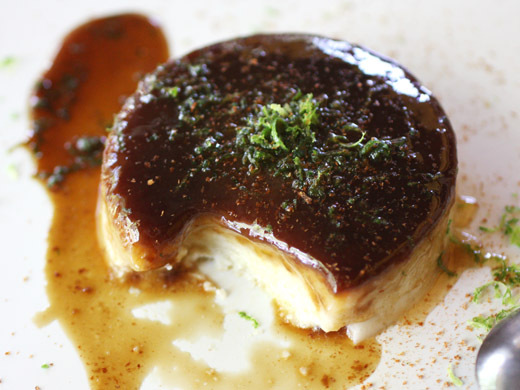 As I read about the flans in the book, I was intrigued by the idea of placing a layer of muscovado sugar in the base of ramekins rather than making caramelized sugar for the sauce. The dark, brown sugar mixed with a little salt, melts easily and becomes a flavorful caramel sauce once the flans have been chilled. The molasses flavor of muscovado sugar sounded perfect for the Coconut Flans. 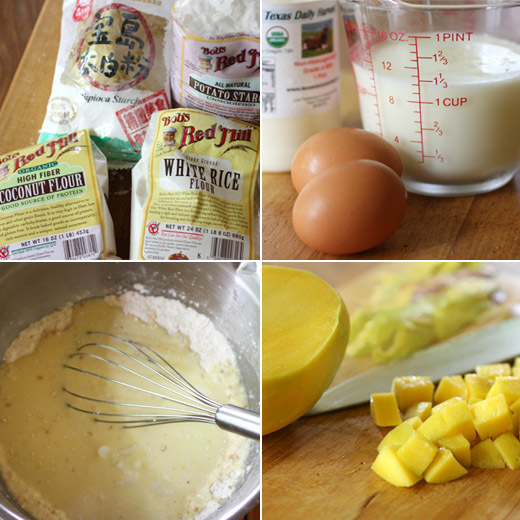 A simple custard was made with coconut milk that had been warmed before being whisked into eggs, sugar, vanilla, rum, and salt. Of course, the recipe suggests using vanilla or rum, and of course I used both. Why choose? The flans were baked in a water bath until the custard was only slightly wobbly in the center. Mine took five minutes longer than the suggested baking time to set. So, pick up a ramekin with an oven mitt and wiggle it a bit to see how the custard is setting as it bakes, and remove from the oven when the wobble seems just right. After baking, the custards have to be chilled, and it's the chilling that makes the muscovado sugar dissolve. So, they need a minimum of four hours in the refrigerator. Then, the flans can be turned out onto dessert plates and topped with lime zest and cinnamon grated from a stick. These flans were cool and creamy with lovely tropical flavor. With all of the great ideas in this book, dinner party-worthy desserts for any season can be whipped up at a moment's notice. For that matter, there's no reason to wait for a dinner party. These recipes make it easy enough to have dessert every day of the week. 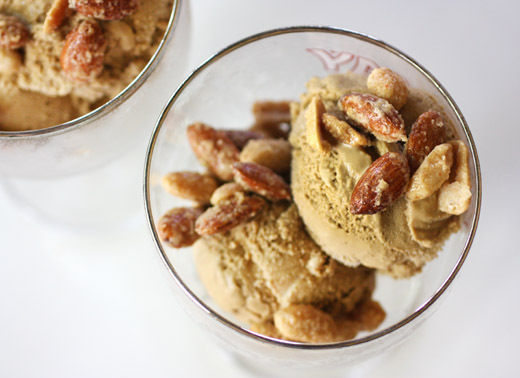 Excerpted from Sinfully Easy Delicious Desserts by Alice Medrich (Artisan Books). Copyright © 2012. Dark muscovado sugar is a deep mahogany color and very flavorful. It easily takes the place of the traditional caramelized sugar in these flans; all you have to do is press it into the bottom of each cup, then ladle the flan mixture on top of it. The sugar dissolves into a sauce when the flans are chilled. These are extra good with a little grated lime zest and cinnamon stick added just before serving. For old-school flans with caramelized sugar, see the variation. Position a rack in the lower third of the oven and preheat the oven to 350˚F. Put a kettle of water on to boil. To line the cups with sugar: combine the muscovado sugar thoroughly with the salt, pinching or mashing the sugar to eliminate lumps. Divide the mixture among the custard cups or ramekins and press lightly on the sugar with another small cup to even it out and compact it. Set the cups in the baking pan. To make the flans: whisk the eggs, sugar, vanilla or rum, and salt together in a large bowl, without creating a lot of froth or bubbles. Heat the coconut milk in a saucepan over medium heat until steaming. Gradually whisk the coconut milk into the eggs, again trying not to raise a froth. Pour the mixture through the strainer into another bowl to eliminate any bits of egg. Ladle the flan mixture very gently into the custard cups or ramekins, disturbing the sugar as little as possible. Some of the sugar may float up, but it will eventually settle back down in the bottom. Put the baking pan in the oven, pull out the rack, and carefully pour enough boiling water into the pan to come halfway up the sides of the custard cups. Bake for 20 to 25 minutes, until the custard is just a little wobbly in the center. Remove the pan from the oven and remove the cups with tongs. Cool on a rack for 15 minutes, then refrigerate, for at least 4 hours, or preferably for 12 to 24 hours. 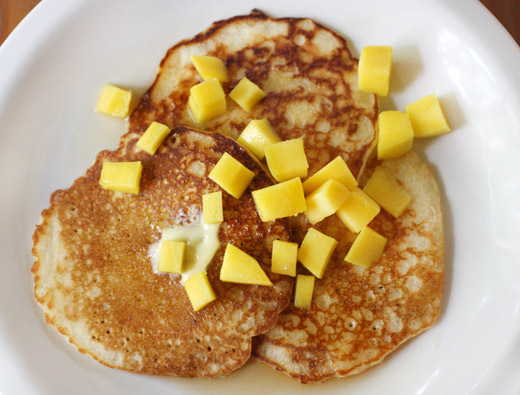 To serve, run a thin knife around the edges of each cup and invert the flan onto a rimmed plate or into a shallow bowl. Or, serve the flans in their cups—the sauce will be on the bottom. 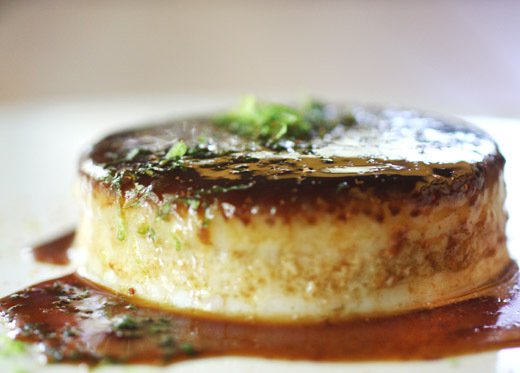 Either way, you can grate a little of the cinnamon stick and some lime zest over each flan before serving, if desired. Every time I leave the house lately, I return with more berries. I can’t stop myself. The season is too short here. Strawberries make a brief appearance at farmers’ markets, and blackberries come and go almost as quickly. When I see them, I grab them. 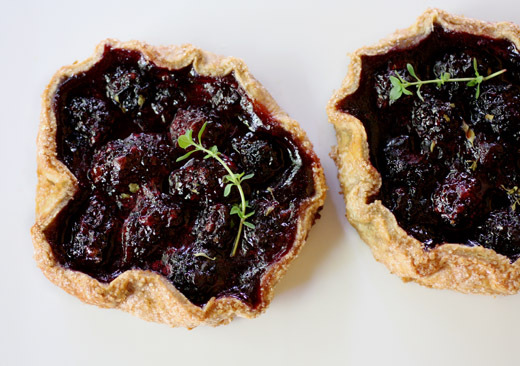 The last bag full of blackberries I brought home were destined for little, rustic tartlets, and I knew I’d find a good option for the crusts in Good to the Grain . There’s a Rustic Rye Dough that’s used for Apricot Boysenberry Tarts in the book, and that was just the kind of whole grain dough I had in mind. The dough is made like a rough puff pastry. It’s rolled into a rectangle, folded into thirds like a letter, turned and rolled and folded two more times before being chilled. The result was flaky crusts with the added flavor of whole grain rye flour that made nice containers for fresh blackberries mixed with berry jam. I mixed the dough by hand, but it could also be made in a food processor. Rye flour, all-purpose flour, a little sugar, and salt were sifted together in a bowl. Cold butter was worked into the flour mixture, and then apple cider vinegar and ice water were added. At that point, the dough was wrapped in plastic wrap and chilled for an hour. Next, the dough was rolled into a rectangle and folded into thirds. For the first fold, the dough was a little crumbly, but it came together during the next turns and folds. The seam of the folded dough was turned 90 degrees, and it was rolled into a rectangle and folded again. This was repeated one more time before wrapping the dough in plastic and chilling it again. 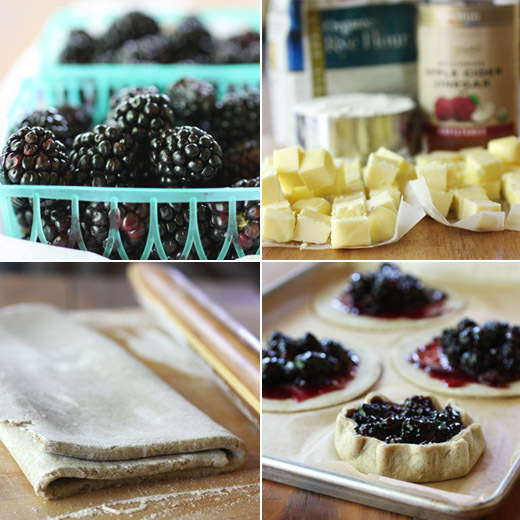 While the dough chilled, the blackberries were combined with some berry jam. Since I was making little tartlets, I worked with half the dough at a time, rolled it out, and cut it into five-inch circles. The blackberry and jam mixture was spooned into the center of each dough circle, and the dough was gathered around the fruit. The tartlets were placed on a baking sheet which went into the freezer before being baked. Just before going into the oven, the tartlet edges were brushed with egg wash, a mix of turbinado sugar and cinnamon was sprinkled on the egg wash, and I added a few thyme leaves. 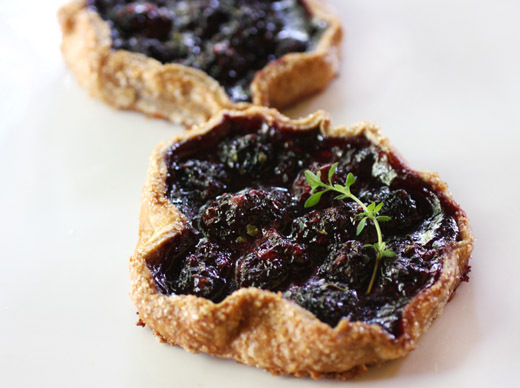 For serving, I topped the tartlets with fresh thyme sprigs from my herb garden for a pop of green on the sticky, dark, blackberry filling. I’ll still have blueberries for a bit when the local blackberries are gone. And, when all of this year’s berries are gone and I can no longer get my fix, at least there will still be peaches. I happen to really, actually like tofu. I like it in all forms whether silken, firm, or extra firm. I like the flavor, and there is a flavor to tofu albeit very mild. It’s versatile enough to be used in endless ways and can be incorporated into dishes both savory and sweet. However, the one way I still have never tried tofu is in its homemade state. Andrea Nguyen’s new book Asian Tofu will change that. After reading the book recently I couldn’t wait to get cooking, so the dish I’m showing here was made with store-bought tofu. Soon enough though, I’ll be turning back to the complete tutorial at the beginning of the book for making homemade tofu from dried soybeans. Obviously, it’s not necessary to make your own tofu for the recipes in the book, but the instructions are there if you want to experiment. There’s also a buying guide to inform you about the varieties typically available in stores. The recipes cover everything from starters and soups to main dishes and salads and even sweets. 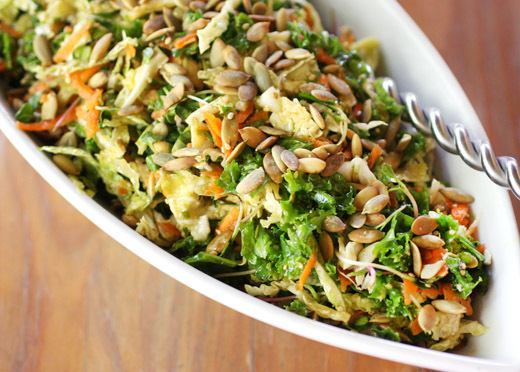 Not all of the dishes are vegetarian but many are, and there’s usually a simple way to adapt dishes with meat to make them vegetarian if you’d like. For instance, the Grilled Crisp Tofu Pockets from Malaysia are made with a sauce that includes dried shrimp paste, but a sweet chile sauce could be used instead. Some pages I marked show dishes like Silken Tofu and Edamame Soup, Twice-Cooked Coriander Tofu, Pressed Tofu and Peanuts in Spicy Bean Sauce, Spicy-Sweet Fried Tofu Buns, and Spiced Chickpea Crepes with Soybean Paneer. When I finally make my very own homemade tofu, I’ll use it for Japanese Chilled Tofu. To get started using the book, I wanted to try the technique of briefly brining tofu before frying it which both flavors the tofu and gives it a firmer texture. 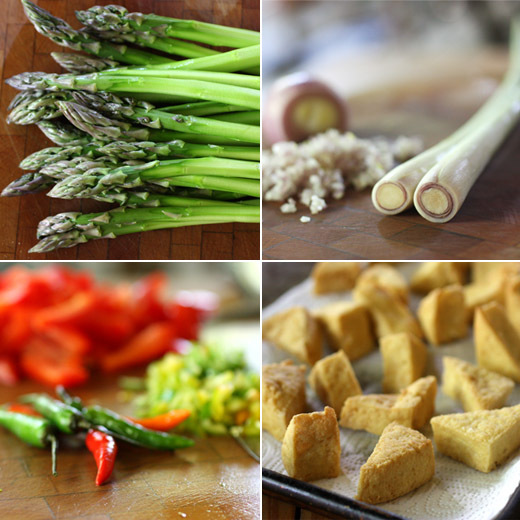 The Lemongrass Tofu with Chiles dish includes that step, and since asparagus was a suggested ingredient, the time was right. In the tips section at the beginning of the book, Nguyen explains that soaking pieces of tofu in hot, salted water allows the surface of each piece to firm up after being dried. Then, when the pieces are fried, the oil drains from them more easily. The salted water also seasons the tofu pieces giving them even better flavor. The cut tofu pieces only need to sit in the hot, salted water for about 15 minutes. Then, they’re drained and dried before being fried. 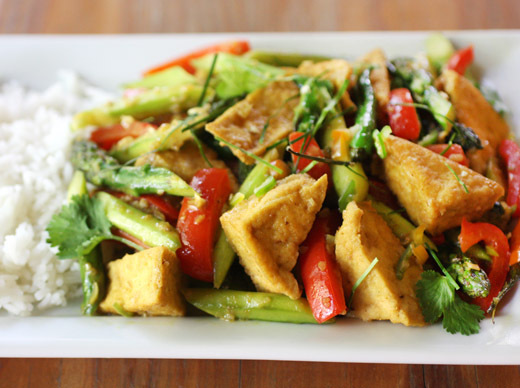 Once the tofu pieces have all been fried and are left to drain of excess oil, the rest of the dish is a snap to prepare. Finely chopped shallot, chiles, and lemongrass were stir-fried briefly before sliced bell pepper and asparagus were added. The recipe includes green beans as it's written, but asparagus is mentioned as an option. After a couple of minutes, the fried tofu was added followed by a mixture of sugar and curry powder. A scant quarter cup of coconut milk and a bit of fish sauce were added, and that was all there was to it. The fried tofu was crispy and chewy with a good, golden crust. Since the crust formed quickly as the tofu fried, there was no chance for oil to soak in and lend heaviness. 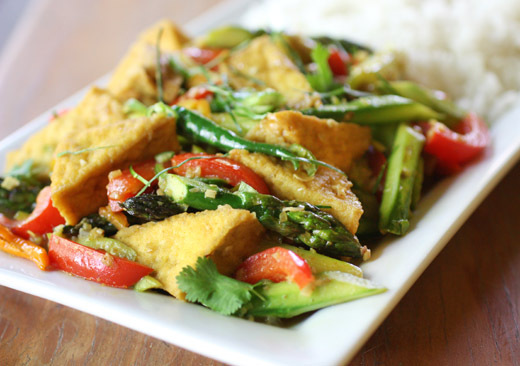 The dish was just rich enough with the tofu and the small amount of coconut milk, and the flavor with the added lemongrass and heat of the chiles was miles beyond what you’d expect from a plate of tofu and vegetables. I can already tell that with this book, I’ll be an even bigger fan of tofu than I was before. Did you take part in Food Revolution Day? It was on Saturday May 19, created by the Jamie Oliver Foundation, and it was a day devoted to educating everyone about cooking fresh, healthy food. Slow Food Austin organized a brunch event where we shared food that matched the theme of the day. I wanted to make something simple with mostly local ingredients. The first ripe tomatoes of the year had just started appearing at farm stands and markets, and I couldn’t wait to use them. I brought home a few different varieties of tomatoes and a bunch of kale from Springdale Farm, and then I stole an omelet idea from Virginia Willis’s Basic to Brilliant, Y'all . In the book, a kale omelet is baked in a hollowed out, big, round loaf of bread, and it makes a beautiful presentation. 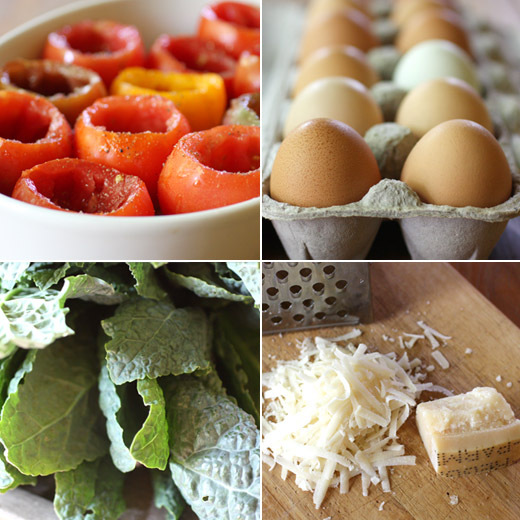 But, for a potluck brunch party, I thought individual omelets would be handy, and I was also thinking back to a stuffed tomato recipe I used to make for summer breakfasts. The dish I used to make involved cutting the tops off tomatoes, removing the seeds, and cracking an egg into each tomato, and then the tomatoes were baked. They’re cute with an intact yolk in the middle, but the problem with the whole egg in a tomato thing is that each tomato needs to be just the right size to fit each egg. By whisking eggs with some sauteed kale, an omelet mixture could be poured to fill tomatoes of any size, and the fitting problem was solved. That’s how the dish you see here was born. 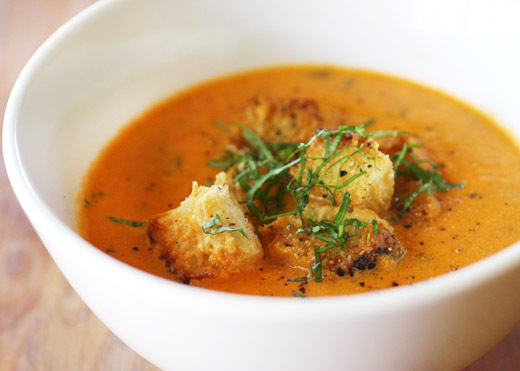 I’ll include the amounts I used in the recipe below, but to make this again, the quantities might have to be changed depending on the size of the tomatoes. First, I sauteed chopped kale with a little minced garlic and red chile flakes in olive oil. Next, tomato tops were cut off and seeds were removed. 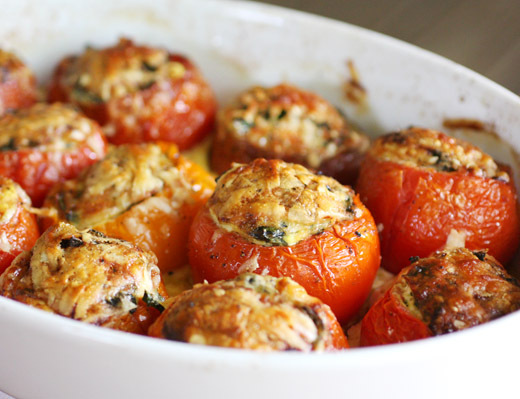 I sprinkled salt and pepper into each tomato, drizzled in some olive oil, and added a pinch of shredded parmesan. The tomatoes were placed in a baking dish. Eggs were whisked, and the cooled, sauteed kale was added. I used a small ladle to pour the omelet mixture into the tomatoes and filled them almost to the top. More parmesan was strewn about on top before the tomatoes were baked for about 45 minutes. I’m thinking back to cracking eggs and watching them overflow smaller tomatoes or only filliing bigger ones halfway, and I’m wondering why it never occurred to me before to whisk the eggs into an omelet to use in a stuffed tomato. It’s really a better idea. And, it's easy. 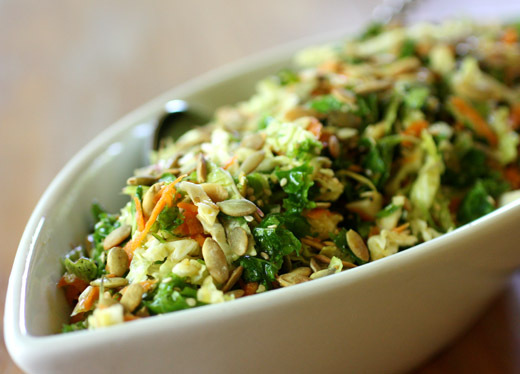 It makes a homemade, healthy, and vegetable-forward dish full of fresh, local ingredients for a food revolution or just for a good, summer meal. -In a large saute pan over medium-high heat, heat two tablespoons of the olive oil and add the red chile flakes. 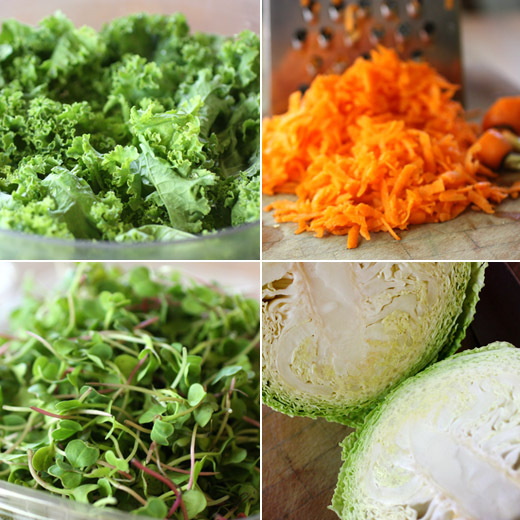 Add the chopped kale and cook until wilted and tender about five minutes. Set aside to cool. 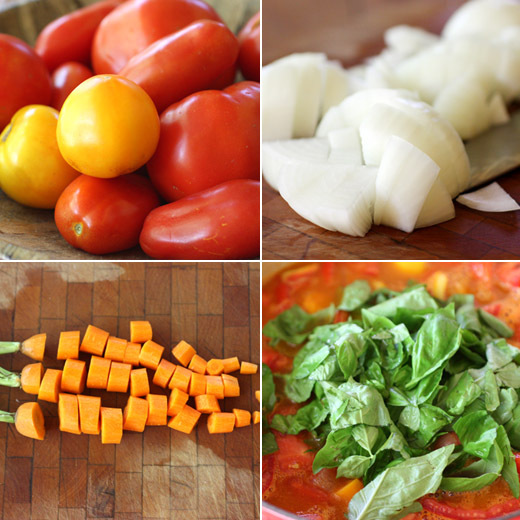 -Cut the tops off each tomato, and using a paring knife or small spoon, remove the seeds to hollow the tomatoes. Choose a baking dish that will hold the tomatoes snuggly so they don’t roll around when the dish is moved, and drizzle a few drops of the remaining olive oil in the bottom of the dish. 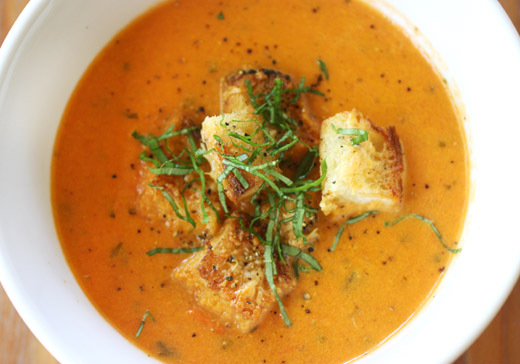 With the last bit of olive oil, drizzle it in the tomatoes. Season the tomatoes with salt and black pepper, and sprinkle some of the parmigiano reggiano in each tomato. 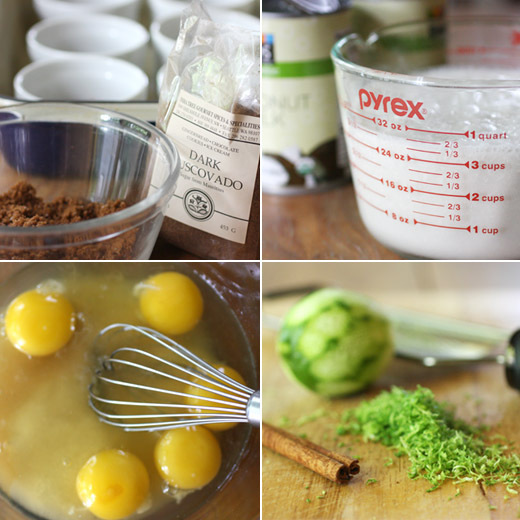 -In a medium mixing bowl, whisk the eggs and season them with salt and black pepper. Add the cooled kale and whisk to combine. Using a small ladle, pour the egg mixture into the tomatoes and fill each almost to the top. 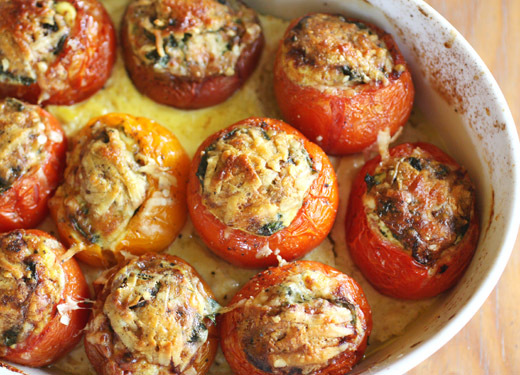 Sprinkle the tops of the tomatoes with the remaining parmigiano reggiano, and place baking dish in the oven for about 45 minutes or until the omelets in each tomato are set and the cheese on top is golden.